With a background in finance, Jenny has extensive experience working with private sector clients on strategy development and operations review projects. Jenny is interested in combining data analysis with industry knowledge to understand complex market environments and empower key decision-makers. Conducted a commercial due diligence of a boutique management consulting firm to evaluate target’s attractiveness and assist the board in making an acquisition decision. Prior to Nous, Jenny worked in Grant Thornton’s Growth Advisory with private sector clients. 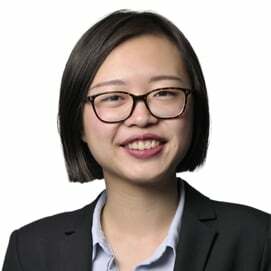 Previously she briefly worked with PwC Hong Kong and volunteered as a Consulting Director at 180 Degrees Consulting. Jenny holds a Masters of Finance and a Bachelor of Commerce from Melbourne Business School. A regular at the gym, Jenny also enjoys long walks in parks and trying out new restaurants. During the weekend, she likes to relax by spending hours on her digital drawing board.